Guitar Training for iPhone. All Flamenco chords and tonalities. 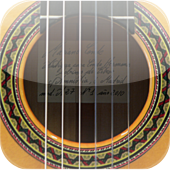 Alternative_Tuner is a guitar tuner for iPhone that offers different types of alternative tunings. If you play the guitar, you will clearly lear to feel, assimilate an play in time. If you dance, you can use it to learn, teach, practice an perfect timing. If you to make sure tha your singing is in time, you will easily achieve this. If you play the cajon,plamas, djembe, etc., silence these during programing and play over the remaining rhythm base.